One of the challenges people have when building their own solar panel, windmill, or hydroelectric generator, is understanding what it takes to connect that power to an end appliance or application. You can’t just plug your laptop into a solar panel you built and expect everything to go smoothly. In the interest of providing a basic step of understanding, I would like to provide this visual, as well as a quick explanation of what each part represents. Please understand that this is just one possible configuration, and the possibilities are limitless with what you can do. What I am giving you here is the simple basics to begin to understand how this works. On the left you have a windmill, solar panel, or other method of generating electricity. The electricity being generated is DC. DC stands for Direct Current. There is much more to be said about direct current vs. alternating current. But for keeping this simple, understand that solar panels and windmills (generally) create electricity that is direct current. The windmill, solar panel, or other generating device is connected to a charge controller. The charge controller is connected to a battery. The charge controller is in place to prevent overcharging of the battery. If you over CHARGE a battery, you cause problems. The charge controller makes sure your battery is not over charged. Moving to the right from the battery is also another charge controller. If you over DRAIN a battery, you can cause problems. The charge controller makes sure your battery is not over drained. From there, you can see that the battery can be used to directly power devices which are based on DC power. Many RV (Recreational Vehicle – motorhome) appliances are based on DC power, though it depends greatly on the RV. However, most appliances we use today are based on AC (or Alternating Current). 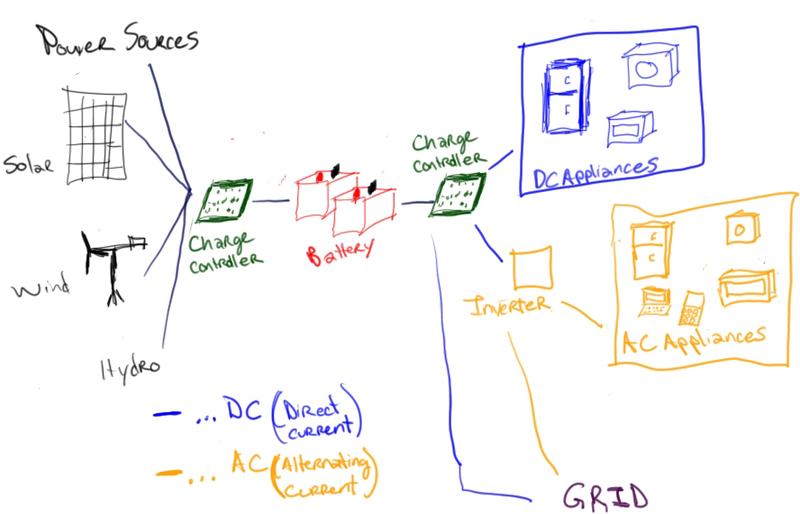 In order to power these appliances and devices, we need to change Direct Current to alternating current. Changing direct current to alternating current requires a device called an inverter. The inverter also uses power in the process of converting (inverting) electricity from DC to AC. Once the power has been converted (inverted), you can use Alternating Current power your laptop, cell phone, microwave, or television. That is the simple explanation of what you will need to use your home built solar panel or home made wind generator to power your laptop. Or, if this is technology you are familiar with, what suggestions do you have? Thanks for the simple and straight forward explanation. We don’t need to know all the science behind the process, only how it works generally so we can use it effectively. Too much information is what drives people away from solar power. Thanks again. I think sometimes it does help to understand the science, but giving a basic start is what’s necessary for getting people interested without being overwhelmed. I’m glad you found the diagram useful and helpful. Can you provide model #s, or sizes, for the controller/battery/controller and inverter? I like this but am unsure of what I would actually purchase to make this system myself with a solar panel. There is no one-size-fits-all solution… A good place to start is knowing how much power you consume/need. That sounds reasonable. I will have to sit down and figure out what is really needed. Here is my first thought for a usable solar system. I would put a small light, probably an LED or set of LEDs into a ceiling fixture and run one of these fixtures into each bathroom and all hallways of my house. The idea would be to have a soft, low level, illumination of the path from bedroom to bathroom. Am I right to think I’d be charging a battery that would kick on at dark and feed the lights till dawn? Depending on what you’re using it for, yes. It would probably be more like a battery bank than just one battery, but yes, generally speaking that is how it would work. The use of the 2 words ‘Convert and Invert’ when refering to just one of them is a mis-use. Reason: The process of taking AC to DC cannot be inverted but, instead can only be converted. However; the process of taking DC to AC is called Inverting. I just wanted to point out the difference for some. Hey Michael! Thank-you for the correction. I didn’t actually know/understand the difference in the language, but it is very important that people refer to the same thing using the same language. Will definitely fix that for any future depictions of this process. Anything else you would add or change in the description here? Thanks again for your comment! I think people should be encouraged to use solar, wind, etc, but they should also consider that understanding the science can’t hurt. A basic understanding of electricity, some electronics, a little physics… can be as important as basic hand tools for those that want to be truly independent. I definitely think that people should understand the science, but people get bogged down, overwhelmed, and then do nothing. So the idea behind the simple diagram and explanation was simply to show the process and pieces of a simple system so that people can investigate options and expand out from here. I HAVE BEEN FOLLOWING YOUR ARTICLES AND I HAVE A CLUE ON HOW TO COPE WITH ELECTRICITY PROBLEM IN OUR AREA.IT IS LIKE WE HAVE A MONOPOLY FOR ONE COMPANY HENCE HIGH BILLS.I HOPE ONE OF THIS FINE DAYS I WILL BE COMPETING WITH THEM. How do you plan to compete with them? Instead of / in addition to competing with them, how could they become a partner for your plans? May i thank you for your reply about my plans on electricity monopoly.Currently i am in self employed sector dealing with among others solar technology.It sound good to partner with them although this is a big company well established.I believe nothing is hard until you try it out i better be somewhere rather than nowhere. actually im planing to built an circuit structure like on what you had sketch right there, now i can imagine the partial structure of my work, but i had a question and it is how can i built a solar, wind and water generator at a low cost, what are the possible materials to used to increase its working capability at a low cost; thanks for your response, god bless! Hey Philip! Thanks for your question. There are a lot of ways to build an inexpensive windmill or solar panel. Here are 2 posts on our site which show you how to do either. Solar power does not have to be expensive, and its good to see that this company is trying to offer something good, without a high price tag. Some companies feel that ï¿½going greenï¿½ means you need to lose a lot of green bills (money). But that shouldnï¿½t be the case, if you are careful you can set up a solar power system without a huge capital cost. Alternative energy is the way of the future, and solar power is the best technology because it does not cause noise like windmills. The interesting thing I learned about windmills is that they are causing deaths among bats because of the wind vortex they create when the wings spin. Bats and birds too. Have you seen the alternatives for wind power though? Concepts like solar updraft towers? Would be interested in your thoughts on that.